Prawns Balchao is a fiery dish that finds its origins in Goa. 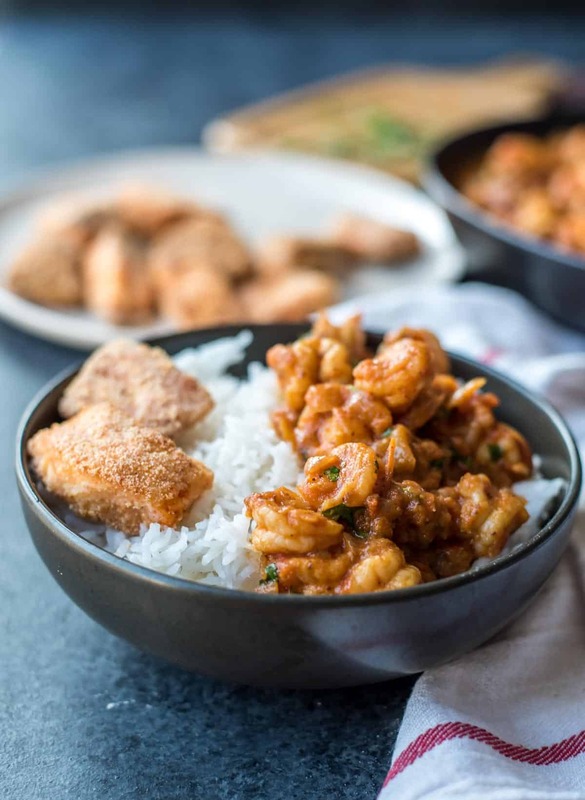 Prawns are stir-fried first and then added to a pickled curry sauce to create a dish that makes your taste buds tingle and leaves you asking for more. Balchao refers to the method of cooking where seafood is pickled in a spicy and tangy tomato-vinegar based sauce. I first had the opportunity to taste lobster balchao almost a decade ago in an Indian restaurant in Orlando called Dakshin. Here’s the thing with balchaos; they are highly addictive – if you eat it once, you’ll keep coming back for more. When I came back home from Orlando, I couldn’t wait to make this curry at home. My husband happily got the ingredients needed, but when I made it, the Lobster Balchao was nowhere close to the one we had at Dakshin. Ugh! 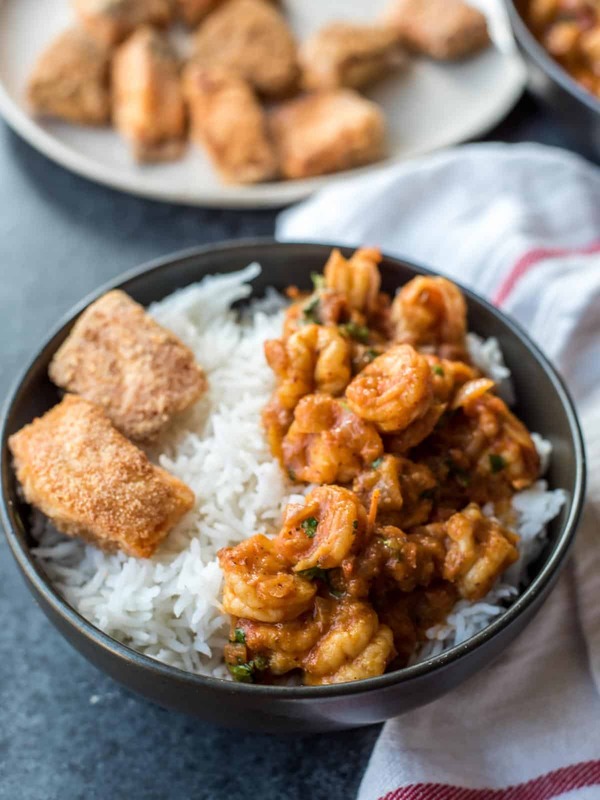 Over the years, I kept experimenting with this recipe using Shrimp or Prawns instead of Lobster (they are so expensive!) without much success. Finally, I figured out that I never used the required quantity of vinegar for this recipe, which was 1/2 a cup. We don’t normally use vinegar while cooking, hence the hesitation. But how can you make pickled prawns without vinegar, right? Once the realization dawned, the recipe was easy to nail! Recipe variation – Don’t let the masala making process dissuade you from making this awesome dish! You can easily substitute the chilies with chili powder and the remaining spices with garam masala but I would have to say making fresh masalas at home does lend a slightly superior taste to the dish. Also, ideally this dish is made from coconut toddy vinegar but since I didn’t have it, I substituted it with vinegar. Recipe source – I researched a lot of recipes for Prawns Balchao on the internet before I came up with this version. I mostly read the recipes to find out what are the key ingredients of this dish and once I got that down, I followed my gut on how much to use. The reason you should do that too is because only you can determine what’s the right balance of spices for your family. What may be ideal for others, may not work for you. Tone it down or take a notch up as needed. 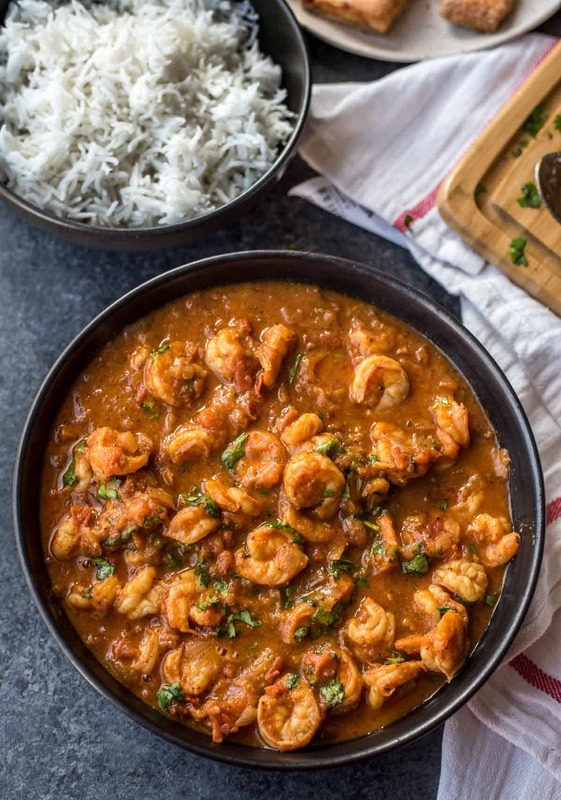 Serve prawns balchao hot accompanied by rice and as I have said before don’t be afraid to experiment with the spice levels when you cook and feel free to reduce or increase the heat levels. 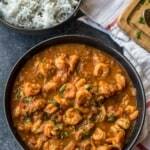 If this recipe for Prawns Balchao has worked for you, please do leave me a comment. I would love to hear from you. How to make prawns balchao? I have two versions of the recipe here – stove top as well as Instant Pot. I prefer the Instant top version because it cooks shrimp/prawns perfectly in 5 minutes – crunchy and well cooked. Grind all the ingredients in the masala section (chilies, garlic, ginger, cloves, cumin and mustard seeds, cinnamon stick and vinegar) to a fine paste. Set aside. In a deep dish pan kept over medium heat, add 1/4 cup oil and when it heats up, saute the prawns (or shrimp, if using) for a couple of minutes, till they change color. Use a slotted spoon to scoop the prawns out and to drain oil. Set the prawns aside. [ For best results, fry in batches so that the prawns are evenly sauteed]. In the same pan, add the remaining oil and fry onions till they are soft and translucent (in approximately 10 minutes). Add tomatoes to it and continue to fry them till the onion-tomato mixture has turned soft and mushy and oil starts to surface (in approximately 10-12 minutes). Add the ground masala along with 1/2 cup of water and mix well. Continue to cook for another 5-7 minutes and then add prawns, sugar and mix well. Add water to adjust the consistency of the sauce to your liking. Cover the pan and let the shrimp simmer in the sauce for another 8-10 minutes till it is cooked completely. Add 1/4 cup oil to the steel insert of the Instant Pot and press the Saute function. Press the Adjust button to move the selection to “Normal” and wait till the display reads “Hot.” and add prawns/shrimp. Saute the prawns for a couple of minutes, till they change color. Use a slotted spoon to scoop the prawns out and to drain oil. Set the prawns aside. [ For best results, fry in batches so that the prawns are evenly sauteed]. Add the remaining oil and fry onions till they are soft and translucent (in approximately 10 minutes). Add tomatoes to it and continue to fry them till the onion-tomato mixture has turned soft and mushy and oil starts to surface (in approximately 10-12 minutes). Add the ground masala along with 1/2 cup of water and mix well. Continue to cook for another 5-7 minutes and then add prawns, sugar and mix well. Add water to adjust the consistency of the sauce to your liking. Press “Warm / Cancel” button and then select “Pressure Cook.” Adjust the time to 4 minutes and set the pressure selection at low. Cover the Instant Pot lid and lock it. Make sure the vent is at sealing position. Once the cooking cycle completes, the Instant Pot will switch to the Warm cycle. Press the Warm/Cancel button and carefully release pressure. Open the lid and let the steam escape. To get about 1 lb of cleaned, deveined prawns, you'll need to buy at least 2lbs of prawns. Looks yummy! I’m going to give this a try in my instant pot.